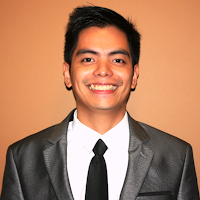 There will be a 4th Cebu Education Expo this February 19-21, 2010 at the SM City Cebu Trade Hall 2, Cebu City. This Education Expo has free entrance. Hopefully I can visit the expo once again since I was able to attend the previous Cebu Education Expo (2nd & 3rd) when I was still a student. 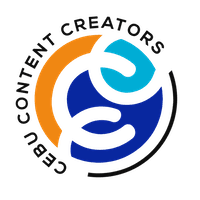 See 3rd Education Expo Post. Education is a process that produces responsible citizens with the essential knowledge and skills set to effectively contribute to the betterment of themselves and their society. Education provides people with the tools and wisdom they need to understand and participate in today's world. These are the reasons why we put great weight in having good education. The Coalition of Better Education, Department of Education, Commission on Higher Education and TESDA, will hold the 4th Cebu Education Expo on February 19-21, 2010 at the SM City Cebu Trade Hall 2, Cebu City. The three-day event serves as a venue where educational institutions can offer their services to the public scouting for finest schools for their children. It provides valuable information, products and equipments to put in place an educational system that is appropriate to the Filipinos. This event is a brilliant step of highlighting educational opportunities especially for the youth. The said expo is open to the public and is highly recommended for students and parents who are searching for credible schools and institutions that offer high-quality education for them and their children. The 4th Cebu Education Expo is an event focusing on all aspects of education, learning and professional development. With exhibits from Universities, Colleges, Training Institutions and other educational institutions, this expo is ideal for those who are in search of quality education and professional development. As our country faces globalization, not only students but also professionals are looking for continuous studies. That is why, this expo is recommended not only for junior and high school students who are considering higher level of education, but also for graduates and professionals wanting to explore newer and more fulfilling employment options. Also, the expo will showcase book companies and BPO’s seeking to recruit new employees of all ages. Microsoft Philippines, Globe Telecom, STI College, Jollibee Foundation, Cebu Daily News, Sunstar Cebu, The Freeman and Business Mirror, with the following exhibitors: Aboitiz Foundation, Academy for International Culinary Arts, BEP NZ Aust Corp_Immigration Placement Services, Cebu Institute of Technology, Center for Healthcare Professions, Eastwestways Consultants, Education Center of Australia, Ellipse Institute New Zealand, Euro Asia Worldwide Consultants, Fusion Excel International, Global Summit Consultancy Assistance Services, Grace Christian College, High Access Line, Ibon Foundation, IDP Education Australia, I-Search International, Lead Career Movers, Magsaysay Institute of Hospitality, National Historic Institute, NSN Worldwide, O'Hair Salon, Paulines Publishing House, Philippine School of Culinary Arts, Philippine State College of Aeronautics, Phoenix Education Specialist, Reyes International School of Cosmetology, RK Franchise Consultancy, Rodech Training Services Link International, Royal Christian College, Southwestern University, St. Theresa's College, University of San Jose Recollettos and University of Visayas. The Coalition for Better Education will be conducting several seminars at SM City Cebu Conference Halls such as: Gallery Walk – Innovative Teachers Contest, Global Filipino Teacher Graduation, Education Nation 10 point Agenda Launch, Busog-Lusog-Talino Parents' Seminar, and Education Leaders Forum on Good Governance. For inquiries regarding the seminars please contact Ms. Marilou Flores – Executive Director, Coalition for Better Education (CBE) at (032) 416-4624 to 26 / (032) 3160330. This exposition is managed by CEO Events and Expos Organizers, Inc. For more event details, please call Manila Office: (02) 995-0734 / 439-1579 or Cebu Office: (032) 273-3827/ 238-3933, or email info@ceoexpos.com / info@cebueducation.com, or visit www.cebueducation.com. 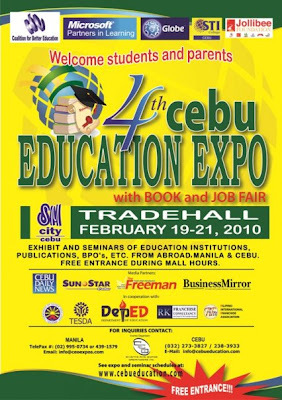 Be there at the 4th Cebu Education Expo 2010!